Harry Kidd recently contacted us about a remarkable 4 reel historical film at the National Archives in College Park, Maryland. The footage shows American soldiers of the U.S. Signal Corps during World War I. The U.S. Army Signal Corps was designated as the sole official agency responsible for obtaining photographic coverage of America's participation in the Great War. Nieuport (Berquet bombing) aerolane, French model, and Lt. Clime ready for photographic flight. Issoudon, France, 23 May 1918. Signal Corps photograph from Harry Kidd's collection on Flickr. The footage was originally shot in 1918 and edited in 1936 for the "Historical Series" of the Signal Corps. We have shown Signal Corps films before in a previous weblog. This footage has new scenes that were not available to the public domain until recently. The final two reels are particularly interesting because these cover the photographic activities by the Signal Corps. Reel 3 features a parade at Columbia University in New York City where the Military School of Cinematography was located during World War I. Reel 4 shows how stereoscopic slides were prepared at Cornell University. 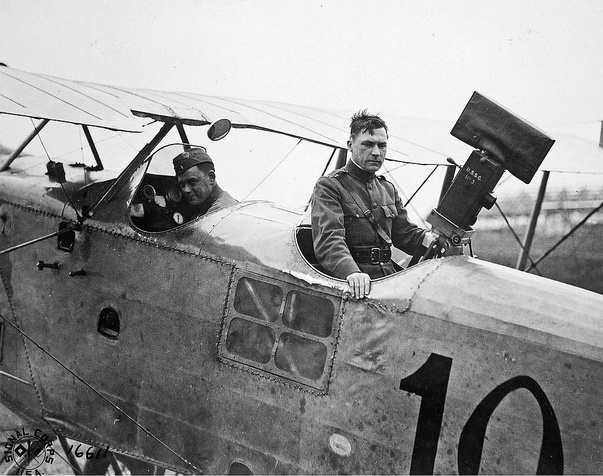 Here the Signal Corps soldiers were trained in aerial photography. The instruction film shows how lantern slides are made and placed in an aerial camera. Aerial photos are shot, developed, and made into an aerial map. Here is also a link to Harry Kidd's outstanding collection of pictures on Flickr, showing the activities by the U.S. Signal Corps photographers of the First World War. We have uploaded reels 3 and 4 of this film to our YouTube channel. With a perfect sense of timing the Library of Congress has released the digitally restored version of Wilbur H. Durborough's World War I feature film On the Firing Line with the Germans. The web launch of this movie was set for Friday November 11, 2016: Veterans Day. An original Great War film from 1915 is now back on the screen! After one hundred years this breathtaking war film on Durborough's film adventures with the German army during the Great War can be seen again in all of its former splendor. Mike Mashon, Head of the Moving Image Section at the Library of Congress, on November 11 announced the online release in the National Audio-Visual Conservation Blog Now See Hear! For the readers of the weblog we published a short introduction on Durborough's historic film. As Mike noted Library staff members George Willeman and Lynanne Schweighofer did a terrific job in selecting the best surviving scenes from among 32 reels of nitrate film, nine reels of paper print fragments, and supplemental 35mm from the National Archives, then assembling the digital files created from them to present a complete version of the film as it premiered in November 1915. So, here is a big THANK YOU! to Mike, George, Lynanne and their colleagues! To coincide with this online release the authors prepared an extended story on the making of Durborough's war film. Based on our previous book American Cinematographers in the Great War, we added new information that was found earlier this year in the German archives as well as in the American and Dutch newspapers. In this new edition we describe how Durborough and his camera operator Ries went to East-Prussia in June 1915, where they filmed the devastating effects of the invasion by the Russian army. We also found out how Durborough with his typical boldness filmed Field Marshal von Hindenburg during this exciting trip to the Eastern Front. The Film Annotation has been illustrated with numerous new pictures on Durborough's photographic work during the First World War. The On the Firing Line with the Germans Film Annotation is now available for download here. We have uploaded the restored Durborough film to our YouTube channel. Enjoy! Credited as cinematographer for Nosferatu and Westfront 1918, Fritz Arno Wagner hardly needs an introduction. During the 1920s, Wagner was among Germany's most in-demand directors of photography and played a key role in the expressionist movement, working with some of his country's finest directors, including Murnau and Lang. His life and work during the First World War however has remained somewhat underexposed. Interested in cinematography from an early age, Wagner became a newsreel cameraman in 1913 and was stationed in New York for Pathé Weekly where he reported on the Mexican Revolution. This became his first taste of real warfare. In March 1914, Pathé had contracted Wagner to bring back to the United States pictures of Victoriano Huerta and his army. Huerta paraded his army in front of Wagner's camera. "He censored the films, had me cut out all the parts favourable to the Federals and then ordered the 'Salon Rojo' to show them as advertising for the troops", Wagner later reported for the trade paper Moving Picture World. At the outbreak of World War I in 1914, Wagner returned to Germany to enlist for the army while still reportedly filming war scenes. 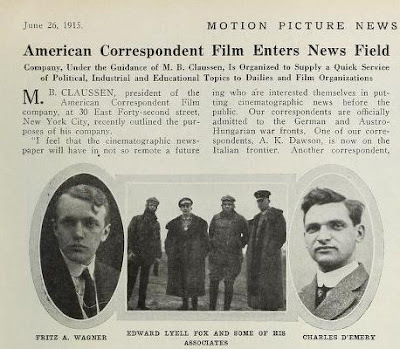 Wagner was mentioned in the publicity by the American Correspondent Film Company as one of their film reporters working at the German front, together with Albert K. Dawson, Edward Lyell Fox and Charles d'Emery. As our research has shown, Dawson and Fox were indeed on the payroll of this film company. But we found no record on Wagner in the files of the German Foreign Office or the German Foreign Propaganda Agency, the Zentralstelle für Auslandsdienst. Apparently, his name was thrown in for publicity purposes anyway. Wagner had a short but painful episode during the First World War when he volunteered for his country's elite cavalry corps, the German Husars. After ten weeks he met with an accident in which his arm was so severely injured that he had to be discharged. An interesting report written by Wagner for the American magazine Leslie's Weekly on his experiences in the German cavalry can be read here. On November 16, the Packard Campus Theater in Culpeper, Virginia, will show W.H. Durborough's World War I feature film On the Firing Line with the Germans. A must-see for anyone interested in World War I film history! Last year the Library of Congress restored Durborough's war film which was first shown again on the screen since 1917 at the Silent Film Festival in Pordenone, Italy. In 1915, newsreel director and cinematographer Wilbur H. Durborough spent seven months with the German army through Germany and Poland and shot 16,000 feet of film. Edited to nine reels and released in November of 1915, it is the only existing, essentially complete World War I feature-length documentary. 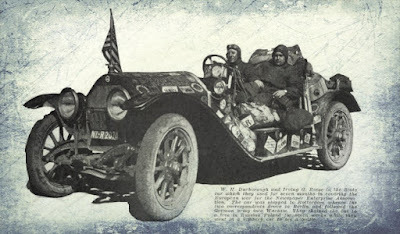 Thanks to the work of Cooper C. Graham and Jim Castellan who spent years reviewing and logging each reel of known Durborough film at the Library of Congress’s nitrate film vaults and the National Archives film collection, the Library of Congress Film Preservation Lab has restored the documentary which had its premier screening at the Pordenone, Italy Silent Film Festival in 2015. In addition to the historic and valuable material shot on the battlefields, the film has rare footage showing the first attempt by the Women's International League of Peace and Freedom to stop the Great War. Stephen Horne will provide live musical accompaniment.